Another trait that is becoming more and more apparent with each of these early character issues is that they continue to discover new powers. 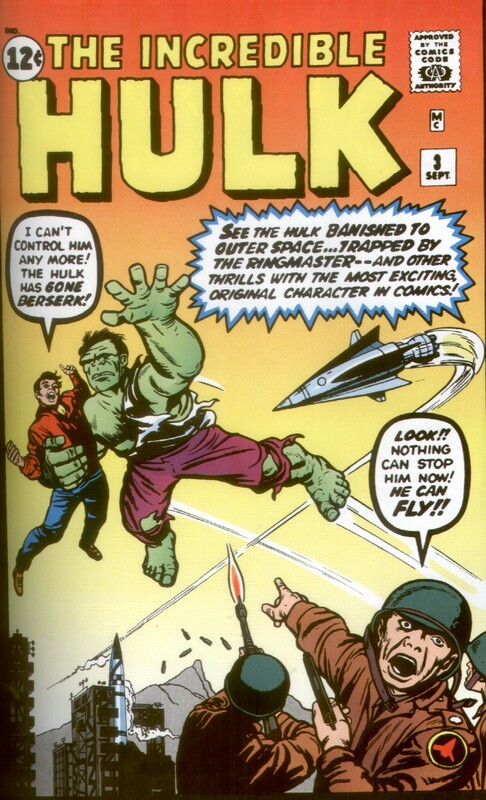 The cover of this issue hints at the fact that the Hulk can now fly! Instead of a lumbering land-based monster, the Hulk has now taken to the skies! It turns out that his “flying” is just jumping REALLY high because his leg muscles are so strong. This Incredible Hulk series is a mess though, and by issue 3 it’s not difficult to notice that no matter what they try to do to try and make him interesting, he is nowhere near as cool as Thor or the Fantastic Four. It seems that each issue is another attempt to reinvent The Hulk. Perhaps this was in order to make his story more appealing, or maybe they hadn’t even fully fleshed out all of the elements to begin with? Let me explain the main plot of this issue first, and you’ll see what I mean. If all my pants were purple I’d be pissed too. Here we start with the Hulk in his underground cement lair. It’s nighttime of course, and he’s sealed inside – to protect the outside world, remember? 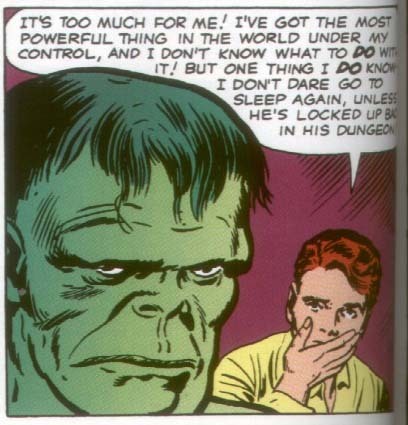 Rick Jones continues to watch him for a while, gets bored, and leaves the compound to head home for some sleep. On the way there, General Ross’s military men take him to the base for some questioning. 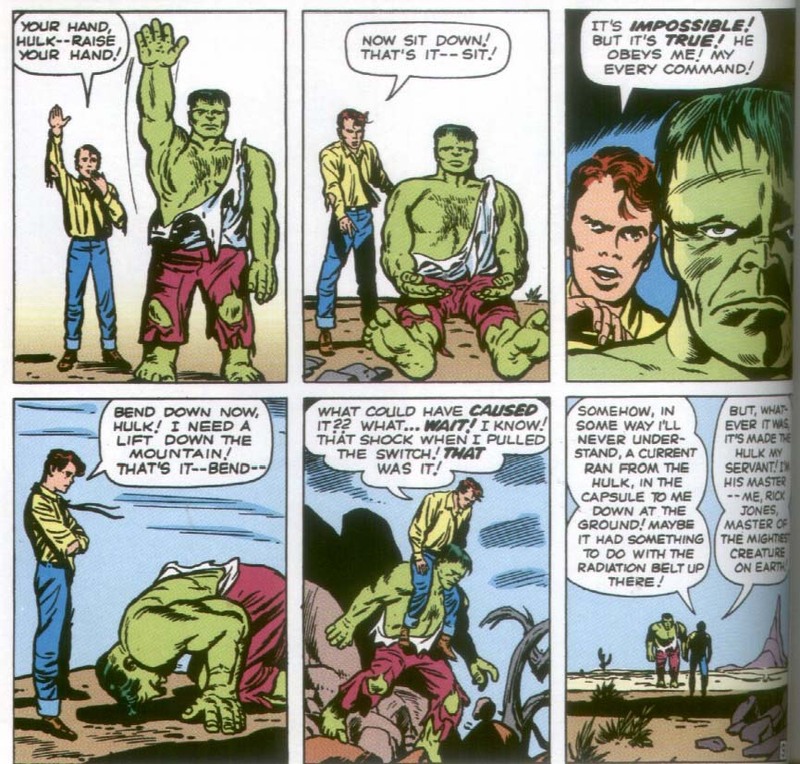 Ross will stop at nothing in order to find The Hulk, and knows that Rick is somehow tied to the monster. Ross knows that Rick won’t give the whereabouts of the Hulk away easily, and so he cleverly exploits the teenager’s naivety. Ross tells him that the Hulk is mankind’s ONLY hope, and is the only one who can be a test pilot for America’s newest missile. Any ordinary man might not be able to handle the G-Force associated with it. 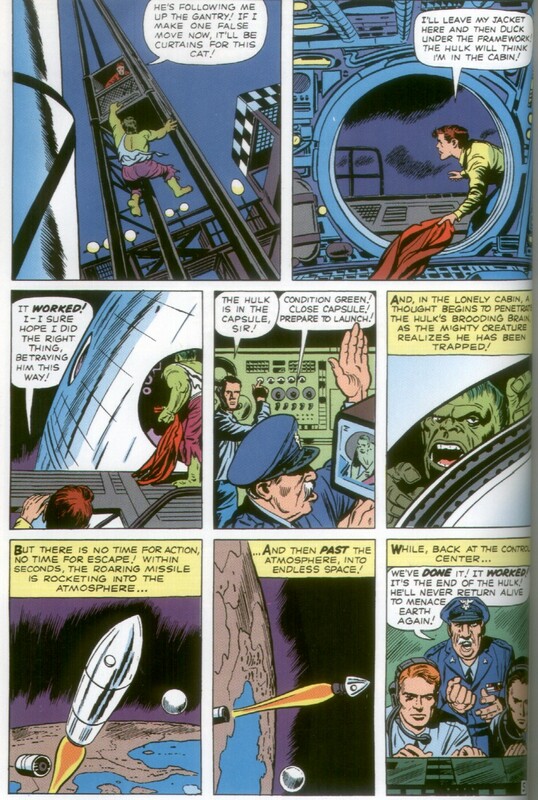 Rick “the Idiot” Jones, guides “his friend” over to the launch area, and the Hulk unsuspectingly boards the rocket. 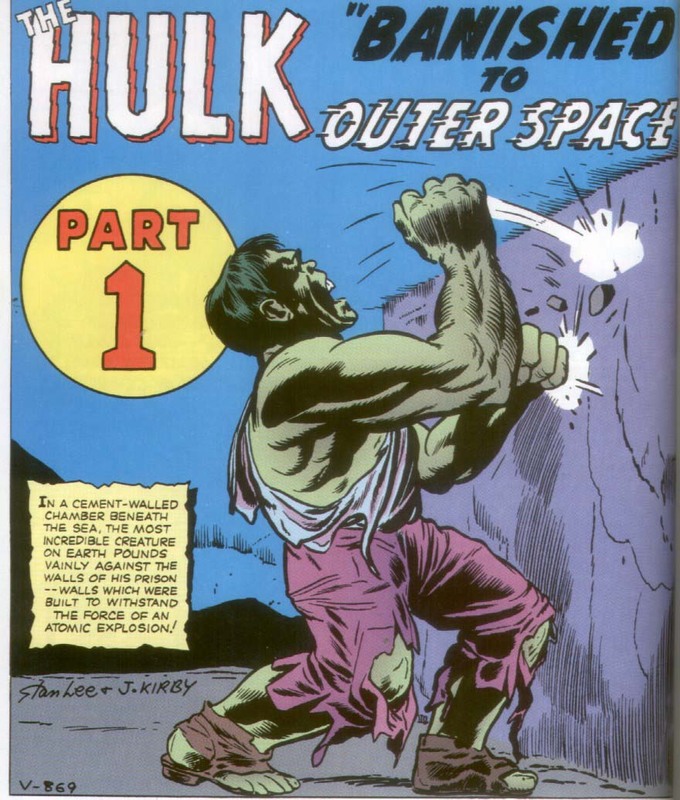 With the Hulk where General Ross wants him, the rocket is fired into outer space – hopefully never to return again. Strangely, the same gamma radiation belt around Earth that transformed The Fantastic Four surrounds the rocket, permanently turning Bruce Banner into the Hulk, losing the ability to become human during the day. Once Rick overhears Ross’s true intentions, Rick sneaks up to a control console at the launch site, and calls for the rocket to return back to Earth. JUST THEN, some of the radiation from the rocket lances down to Rick – bonding both him and the Hulk somehow together. Again, we have the instance where a space capsule falls to Earth and JUST HAPPENS to land right where it needs to. 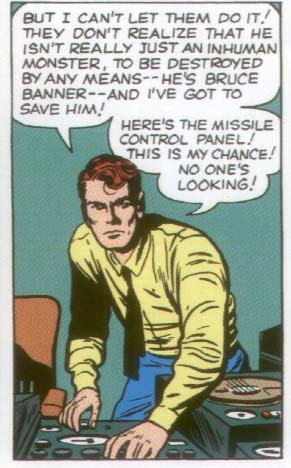 This time it’s within RUNNING distance of Rick Jones. What the HELL? So after a brief game of Simon Says, the Hulk is now Rick’s servant? 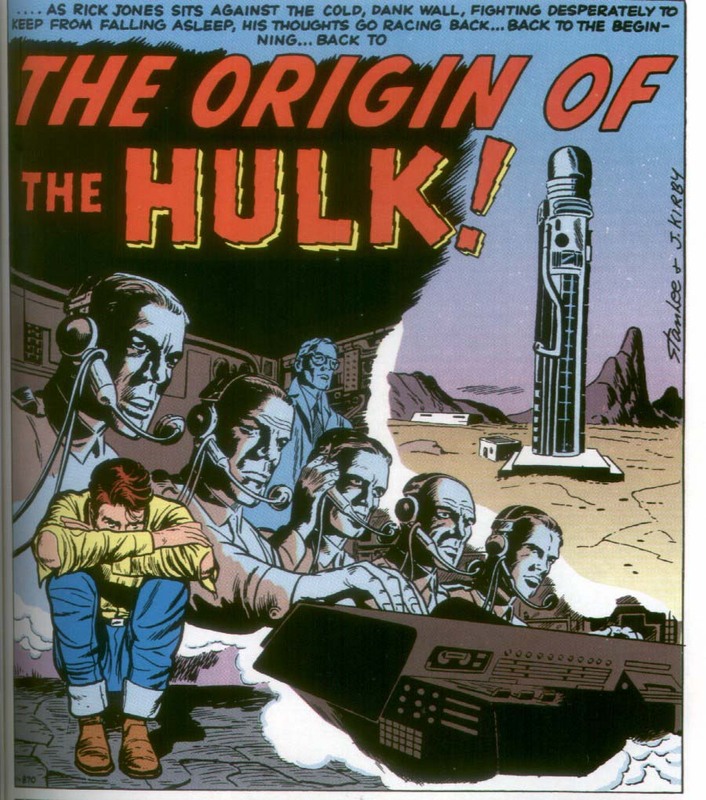 The comic goes on to depict the Hulk as a weapon placed in the hands of a teenager. Most interestingly about this sudden shift is the fact that it turns Rick into the tortured soul, placing Bruce Banner as an afterthought within the story. After this series of events, it goes BACK to Hulk’s origin. This is 3 times in 3 issues. A bit too much. When I first saw this picture, I thought, “how BRILLIANT! Marvel invented the lightsaber 15 years before Star Wars!” Then I realized it might just be a phallic symbol. Unfortunately for this issue, it seems to have a lot going on – TOO much in fact. I haven’t even delved into the second half of the issue, which only then introduces a new subplot and the villain of the issue. This issue not only is tedious to read, but also has a problem with pacing. Maybe it’s because the Ant-Man and Thor stories I’ve been reading are a lot smaller in page count. Anyway, I will discuss the second half in the next post. PreviousCCA – The Comics Code Authority!